Car & Truck Wheels - Atlantic Used Truck & Salvage Corp. Car & Truck Wheels - Atlantic Used Truck & Salvage Corp. Car & Truck Wheels - Atlantic Used Truck & Salvage Corp.
Driving is rough on wheels, especially up here in the northeast. Rain, snow, sand, potholes and curbs all contribute to wheel damage. All wheels, whether steel or aluminum alloy eventually become rusty, corroded, warped and bent. Rusty / corroded wheels not only make your car look bad but they also effect performance, safety and contribute to rapid tire wear. Because of the high cost of new wheels (especially aluminum alloy styled wheels) buying used wheels will save you big money. Example: list price for a new 2007 Camry 16″ X 6.5″ 8 spoke aluminum alloy wheel is $432.00. Atlantic’s price for that same wheel in excellent condition is $150. That’s less than half the cost of a new wheel. Atlantic Recycled Auto Parts carries a large inventory of steel and alloy wheels for cars, pickup trucks, mini-vans & SUVs. 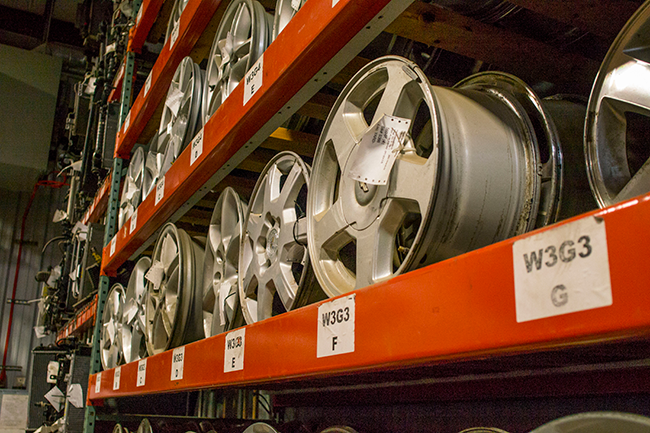 Our wheels are original equipment (OEM) and are guaranteed to work for you. If you’re not sure of the size and style wheel your vehicle uses, call us at 800-225-0812 (978-459-2544 local) and we will help you find the correct wheel for your vehicle.